Pre-orders are non-refundable for any reason!! PLEASE PLACE ANY PRE ORDER ON A SEPARATE ORDER FORM. DO NOT Include items to be shipped immediately. It will hold up your order. 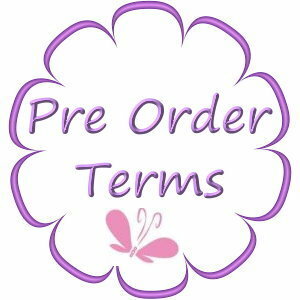 Pre Ordering is a Commitment by you and DollsbySandie.com. You are asking us to order and reserve this kit for you. We are ordering and reserving this kit for you. A Deposit is due upon Pre Ordering any Doll Kit and will be applied directly to your order. (Your Deposit will be shown at Checkout, before you submit this order). This way you will know your total cost before you place your Pre Order. There are no surprises this way. To determine your Deposit, simply put this kit in your shopping cart and proceed to checkout. Your Deposit will be displayed before you are asked to submit the order and pay. You will receive an email response from me, acknowledging your pre order. When you place your pre order, I order and reserve this kit for you. You will receive email updates and your balance due invoice will be mailed ahead of arrival time. The Balance is due when the kit arrives. Your Paid Deposit is NON-Refundable, NON-Transferrable. No refunds, No exchanges and No exceptions. Your Deposit will be forfeited if you Cancel the Pre Order or do not pay the balance. Delivery Times are told to us by the Manufactuer. This could be sooner or later then projected. We have no control. It is our pleasure to help you with your Pre Order.